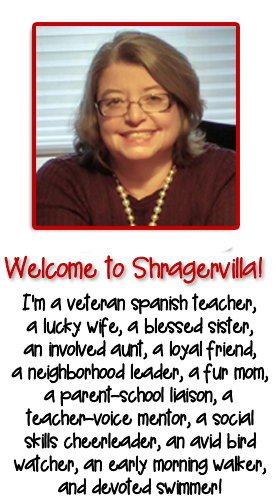 April 8, 2015 By Personal thoughts and beliefs of E.B.Shrager - do not represent those of any past or current employer. 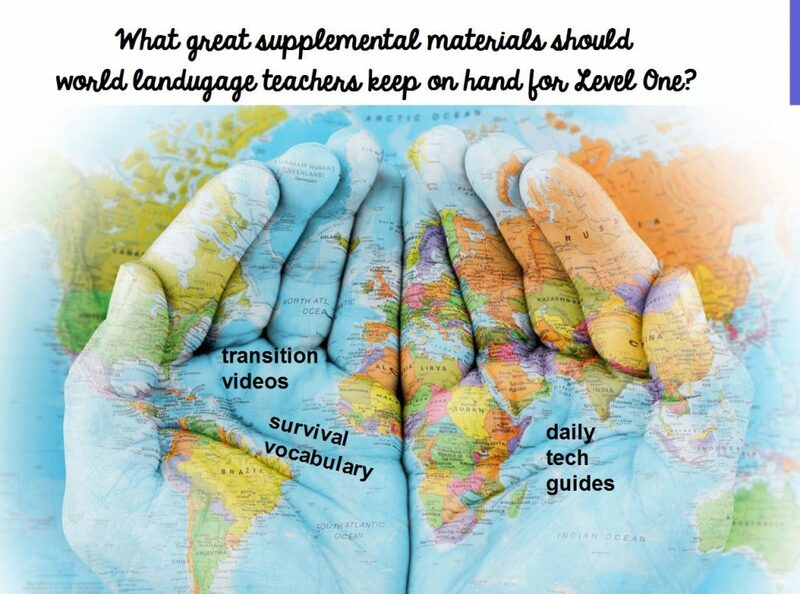 Keep Transition Videos, Daily Tech Guides, and Survival Vocabulary handy to keep students on task and in the target language. 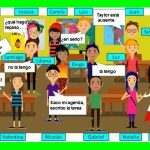 I teach seventh, eighth and ninth grade Spanish 1 in a district that also uses Realidades 1 and I have created three categories of supplemental materials based on students needing minute-by-minute visual and audio support to stay on task and in the target language. As I describe in my book you need to make a few slides for each lesson. They can be in PPT, ActivInspire, SmartNotebook, which ever you use to project onto the screen in your room. Make a slide for each activity in the lesson. First category, insert transition videos in-between your activities. Here is the list of the 50 videos now available in Spanish. Second category, use one of my daily tech guides – meaning a PPT of 50 – 150 slides for each day so that there is visual support for the complete 50 minute lesson. They are sold individually or in bundles. After I teach a lesson, it takes a couple of hours for me to put them into PPT as I use Activ Inspire and to document it so that it can be sold individually. It takes another 10 hours of work to bundle them. Some months I am able to do this, other months there are too many family and work obligations that I can’t keep up. My goal is to complete them next year as I teach the unit. If you haven’t seen a daily tech guide, you can down load for free the first day to get a feel for one. For more info, go to this previous blog. Third category, direct instruction of survival vocabulary, including student – to – student interactions. From what other teachers have told me, these three categories of activities complement all level one texts. Have a good think about what you want to accomplish in level one and let me know how I can help you. April 1, 2015 By Personal thoughts and beliefs of E.B.Shrager - do not represent those of any past or current employer. 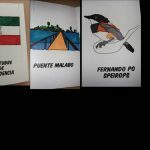 Today we are at FLENJ and here are the links to the different languages! On your cell phone click on the three white bars in the black rectangle above to open the menu and find your language link! On your computer, click on your language in the black box above. March 28, 2015 By Personal thoughts and beliefs of E.B.Shrager - do not represent those of any past or current employer. 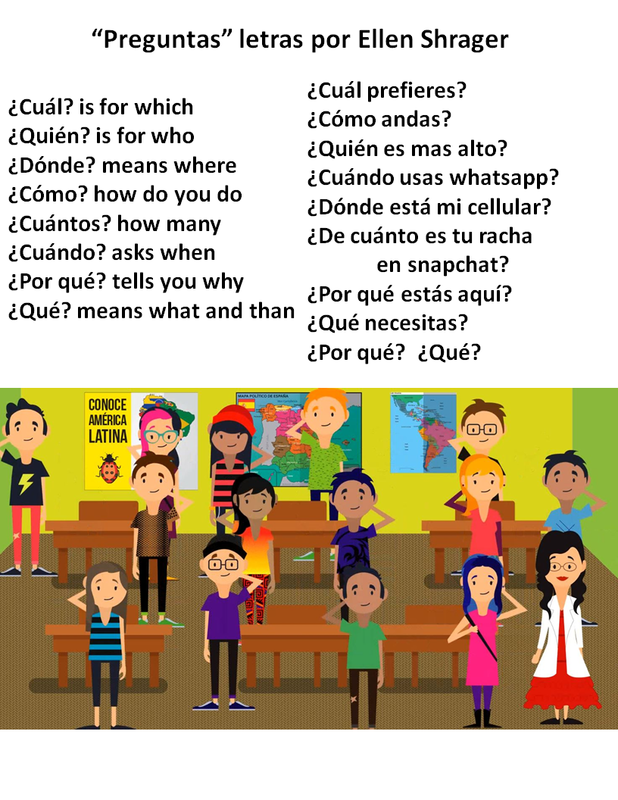 A Spanish teacher asked how to help students with those pesky abstract question words. A few floating teachers were wondering how to hang up question words in multiple rooms. My answer is the question song. 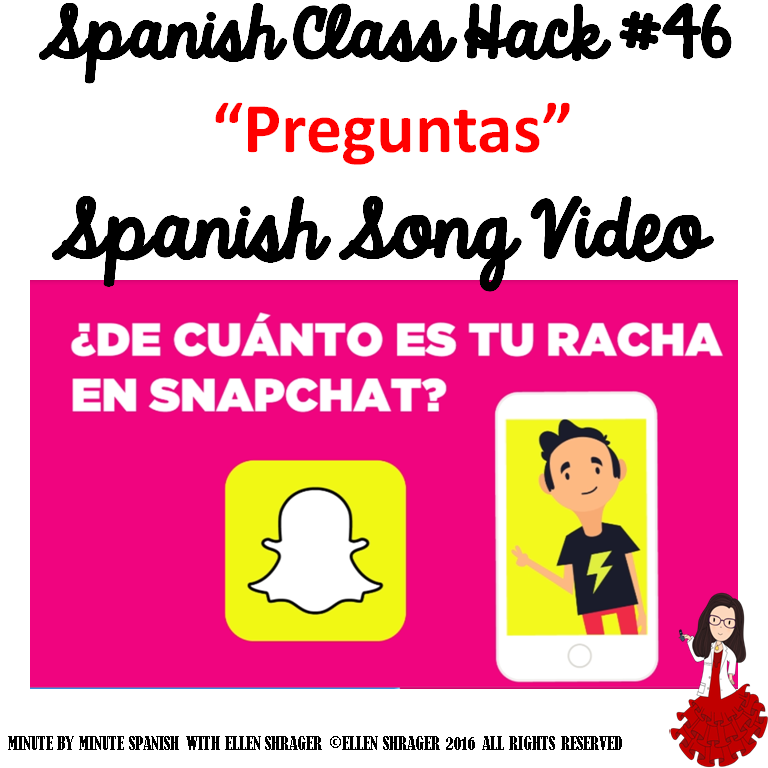 Preguntas Spanish Song Video makes those abstract question words stick in your students’ memory! I use a remote presentation device so I can click through my daily guide for each class. Every day we devote three minutes to asking and answering questions with fabricated stories and it pays off – my students come back years later and can still sing the question song and easily answer questions. I’ve had 30 year olds sing the song to me in the grocery store upon a chance encounter! The ninth grade Spanish teacher tells me he can always identify my former 7th grade students because they can answer questions easily. I know there is a Jingle Bells version but for me it interfered with students learning because, well, to them, it is the Jingle Bells song. It is also too long over 3 minutes and I wanted something under a minute, catchy, and with a Latin beat. I play it every day . Sales support the fairly desperate Venezuelans who created the video. Learn more about them here. Purchase Video Here. Next I flip through the slides and the students ask their partners the following questions and they make up answers. 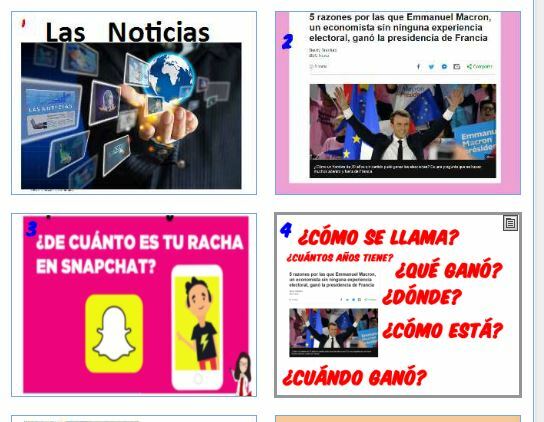 I play my ‘noticias’ video and then show my Spanish 1 students the headlines from a BBC Mundo article – we read the headlines and the caption to the visual. 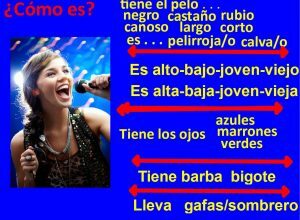 Next we sing this song and then I ask questions about what we have just read and they answer in Spanish. Students can stand or move around the room a bit for this. By the end of the year they are experts at spinning stories in Spanish. 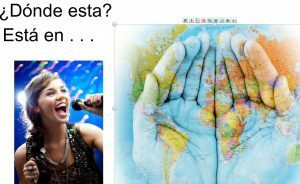 Last year I started sending work to some desperate Venezuelans, and now the song is a musical video that my students just loved this past year. Click here to learn more about our Venezuelan singer. Invest three minutes a day in this review of questions and vocabulary and you and your students will be glad you did!